BIO PLANÈTE will be presenting its new virgin milk thistle oil for the first time at BioFach 2017. This oil, pressed from the seeds of milk thistle, is rich in polyunsaturated fatty acids and contains the sought-after ingredient silymarin. This makes it an oil which is exceptionally good for the health and an ideal addition to the BIO PLANÈTE vitality oil range for the everyday diet of health-conscious food-lovers and people with increased nutritional requirements. By producing milk thistle oil, the pioneer in organic products is also responding to a rise in requests for this oil, which is still almost impossible to find in natural grocery stores. Milk thistle oil is said to protect and strengthen the liver and have a regenerative, anti-inflammatory, anti-toxic effect. The plant has a content of 0.6 to 5.6 % silymarin, a flavonoid complex known for its positive effect on the liver. It can thus, for example, protect the liver against damage from toxic substances such as alcohol, medicines or poisonous mushrooms. Various studies have also described milk thistle as having a positive effect on chronic liver conditions such as hepatitis C. Containing 46 mg per 100 ml, milk thistle oil is also rich in vitamin E, which helps protect cells against oxidative stress – some 2.5 tbsp. of milk thistle oil alone already meets our daily requirement of the vitamin. 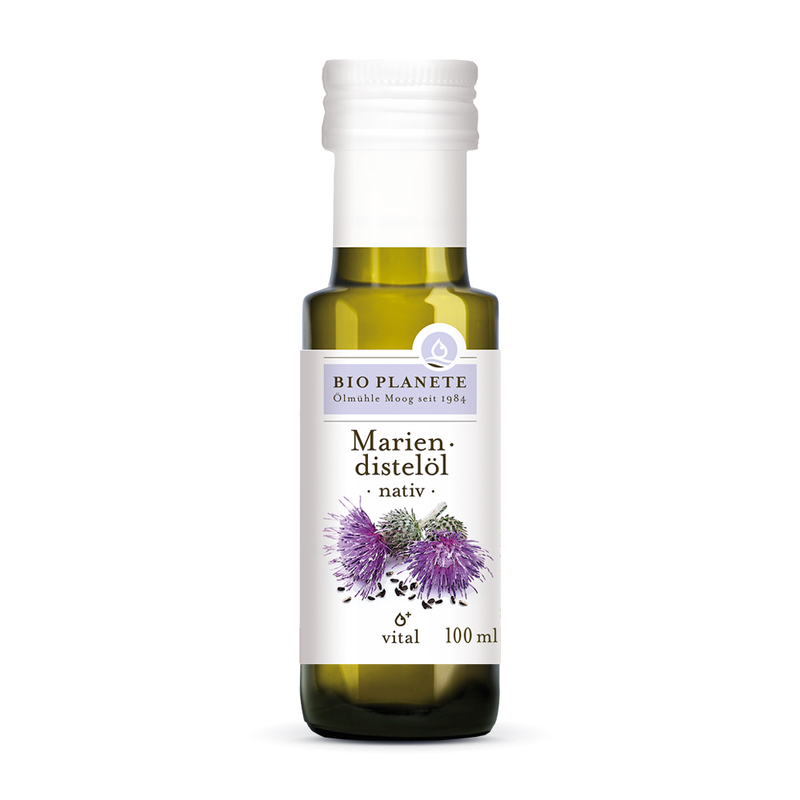 BIO PLANÈTE milk thistle oil has a pleasantly mild and slightly nutty taste, adding a special touch to salads, dressings and dips and enhancing hot vegetables, yogurt and smoothies. The oil can also be used pure as a food supplement. However it is used, it should always be served cold to protect the precious ingredients. The oil can also be used for cosmetic treatments, for example when creating creams and lotions to protect the skin against the elements such as the wind or cold, or for irritated, dry, rough or ageing skin. The milk thistle is also known as Our Lady’s Thistle or the Holy Thistle. The plant, with its round, purple flowers, was originally found in South Europe, North Africa, Asia and Russia’s South. Today it is also cultivated in Germany, Austria and Eastern Europe. According to legend, Mary, the Mother of God, fed baby Jesus beneath a thistle while fleeing Egypt. Drops of milk fell onto its leaves and left behind white markings. As far back as ancient times, the Greek physician Dioscorides (40–90 AD) recognized the plant’s healing properties, and in medieval times it was grown for healing purposes in monastery gardens. Recently, the milk thistle has undergone a comeback, and is increasingly coming into the focus of orthodox medicine and homeopathy. Suitable for vegetarians, vegans and a raw food diet. BIO PLANÈTE milk thistle oil will available in health food stores from March 1, 2017.